The John S. Lunt Friend of Technology award is a special award that the ACTEM board gives on occasion to recognize a person who has made a long term, lasting contribution to supporting and advancing the use of technology in education throughout the state of Maine. Unlike the ACHIEVE award, there is no application or nomination process, rather board members have a long discussion about who we should recognize and why. This year the conversation revolved around trying to figure out and standardize how we identify our honorees and at one point, Barbara Greenstone said that if you mention a person’s name in connection to this award to anybody who is involved in technology around the state, the response should be “well of course!” So, with that standard in mind, our litmus test is now in place and when this name came up in the discussion, not only was the response, “well, of course!” It was also, why haven’t we given her this award yet? And, she should have gotten it long ago . . . So, I figure I need to give a little history lesson before actually presenting this award because the longstanding, long term impact started a long time ago. Well, can you remember when somebody would come to your school from DOE and say “Hi, I’m from the DOE and I’m here to help.” And people believed it and thought it was a good thing that they came to help? Yeah, I can’t remember that far back either. . .
Tonight’s honoree was actually there way back then! And she wasn’t into technology to start, she was into early literacy. It was when she moved over to the Maine Center (and how many of you remember that organization?) that she became involved in technology in education in a big way. Of course a $7 million dollar grant will go a long way to getting involved in anything in a big way! 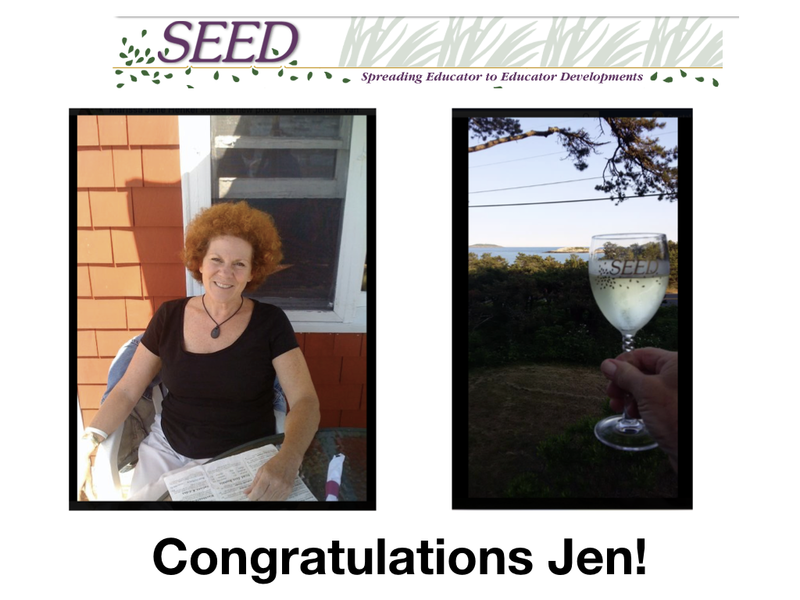 So, Jenifer Van Deusen became the Chief Horticulturist for SEED - Spreading Educator to Educator Developments through HQTLT - or High-Quality Teaching and Learning with Technology. SEED had a huge impact around the state by recognizing teachers as curriculum developers and as Technology Learning Leaders and providing professional development opportunities around the state for almost a decade back around the turn of the century. But mostly, thanks to Jen, the true success was recognizing that the people are the most important part in the learning and she built out the infrastructure for the rest of the SEEDlings to grow and to thrive. If you don’t think there hasn’t been a lasting impact from that project, check out all the SEEDlings who have been an integral part of ACTEM at the officer and board level, and the conference committee, Or the SEEDlings who have been recognized as ACTEM teacher/leader/ACHIEVE award winners over the years; even the SEEDlings who are presenting at this year’s conference. SEED is truly an embedded part of ACTEM’s DNA. If you’ve ever seen these people in action, attended their presentations, or followed them online; then you have been impacted by Jen’s work with SEED. Jen and SEED did such an awesome job providing high quality, high touch technology professional development around the state that she and SEED became an integral part of the first few years of MLTI professional development. Those early training sessions were a partnership between SEED, MLTI and Apple to provide opportunities around the state for teachers to explore the opportunities provided by all those white iBooks flooding 7th and 8th grade classrooms. And again Jen’s talents in elevating people and enabling them to provide high quality, high touch pd shown through. After SEED, Jen moved on to Higher ED and has been working in the medical training field and bringing her experiences at SEED to the college level. Now, I really should try to channel Jen for a few minutes and milk the whole SEED metaphor about spreading seeds, things taking root and stuff sprouting up around the state, helping the garden grow and all those sorts of things, but I know I can’t do it justice the way Jen can so I’ll save the fertilizer spreading for later tonight at Brew Cue. . . And since this is the only thing between you and Brew Cue, I’ll move it along. I first ran into Jen back in 1999 when my school was just getting started with 1:1 laptops and was the pilot for what became MLTI. The Maine Center and the early SEED crew provided our professional development and they were awesome! It didn’t take too long before I started getting involved with SEED, became a developer, offered a variety of PD sessions, and became a card carrying SEEDling. And I wasn’t the only one, Jen has a great way of making everybody she works with feel special and included in the group. Because of Jen’s leadership style, being a part of SEED was something very special and very unique in education. Jen’s SEEDlings are very much an extended family who have continued to contribute to technology in education around the state of Maine and beyond. Jen’s impact has truly been wide spread and longstanding!